Jute is a vegetable fibre. It is very cheap to produce, and its production levels are similar to that of cotton. It is a bast fibre, like hemp, and flax. Coarse fabrics made of jute are called hessian, or burlap in America. Like all natural fibres, Jute is biodegradable. 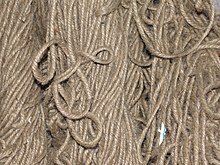 "Jute" is the name of the plant or fiber that is used to make burlap, Hessian or gunny cloth. It is very rough and is very difficult to cut or tear. The jute plant is easily grown in tropical countries like Bangladesh and India.India is the largest producer of jute in the world. Jute is less expensive than cotton, but cotton is better for quality clothes. Jute is used to make various products: packaging materials, jute bags, sacks, expensive carpets, espadrilles, sweaters etc. it is obtained from the bark of the jute plant. Jute plants are easy to grow, have a high yield per acre and, unlike cotton, have little need for pesticides and fertilizers. In Iran, archaeologists have found jute existing since the Bronze Age. This page was last changed on 23 October 2018, at 09:39.